EDB file is a Microsoft (MS) Exchange Server database file that contains mailboxes of all users on the server machine. The user mailboxes have several data items such as emails and all their attachments, calendars, contacts, tasks, notes, and journals. Any communication that is carried out in the organization having the setup of Exchange Server is saved in the EDB file. Next, a PST file is an Outlook data file that contains mailboxes of a particular user on the client machine. Also, MS Outlook can be used as a stand-alone application or can work with the Exchange Server. But why convert EDB file to PST format? There are several reasons for converting the EDB file into PST format. One such reason is the maintenance of backup of the data that is currently present on the Exchange Server. As PST format is proprietary to Microsoft Outlook, you can import the converted PST file in Outlook and access all the stored data once the EDB file is converted to PST format. Next, PST files are flexible in the sense that they can be stored at any desired location. With this, you can move it across different machines and access the mailbox data anytime, anywhere. In such situations, you need a safe, powerful, and do-it-yourself EDB to PST conversion software to convert the EDB files into Outlook PST format successfully. 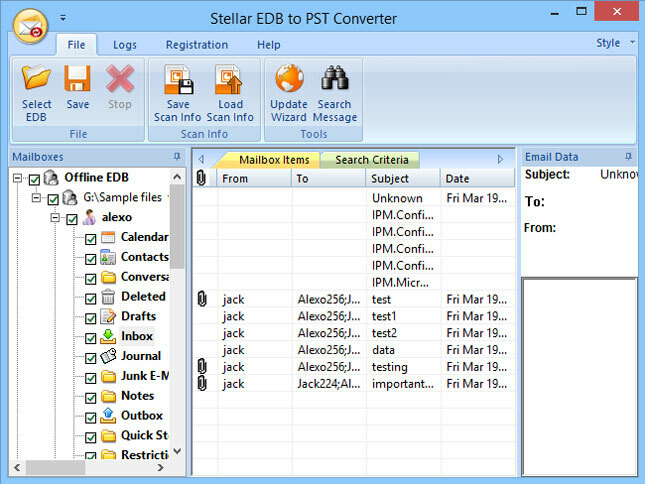 Here, Stellar Converter for EDB can be of great help to you. It has been designed and developed to perform EDB to PST conversion effectively. Thus, it is considered as one of the best ways for the purpose. 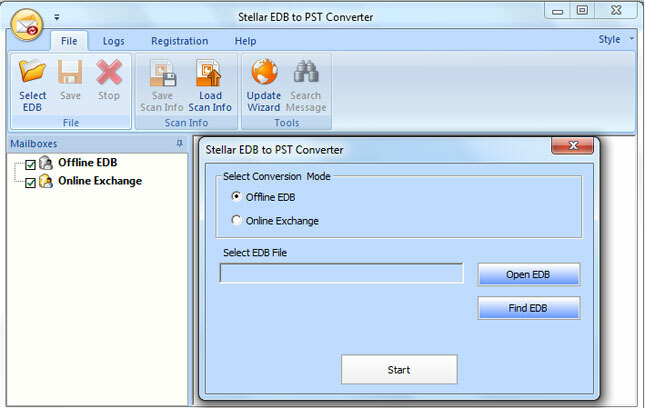 If you wish to convert the EDB files into PST format with a specialized software known as Stellar Converter for EDB now, you should execute the steps that have been mentioned below, thereby, successfully converting the EDB files of Exchange Server into PST files of MS Outlook email client. You may try the demo version of the software from here. 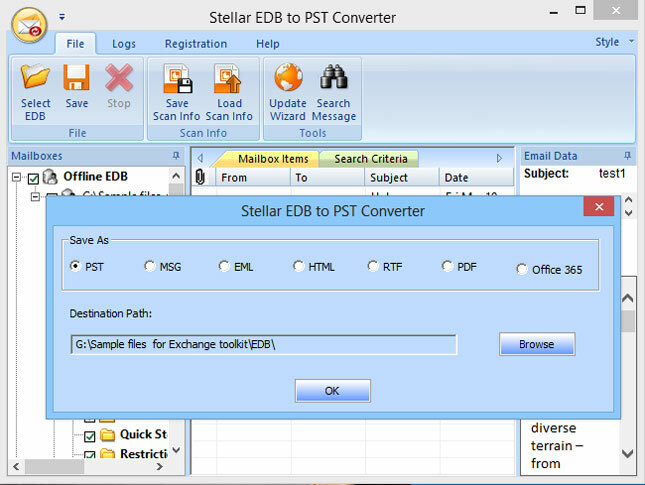 Step 1: Run Stellar Converter for EDB tool by giving a double-click on its icon. In so doing, you get the interface of the tool that provides two modes for the conversion process: Offline EDB and Online Exchange. Step 2: Select Offline EDB if you have a disconnected EDB file. In the same interface, you should click Open EDB to select the EDB file you wish to convert, provided you know the location of EDB file. In case, you do not know the location of EDB file, you should click on the Find EDB tab for the tool searches for the EDB file located on the machine’s selected drive. (i) With this, you will get a dialog box wherein you need to choose the drive in which you would like the tool to search for the file. Also, you should check the Search Subfolders checkbox for permitting the tool to search in subfolders. (ii) Then, all the EDB files present in the chosen drive will get displayed in the list of Search Results. (iii) Select the EDB file you need to convert and specify the MS Exchange server type. 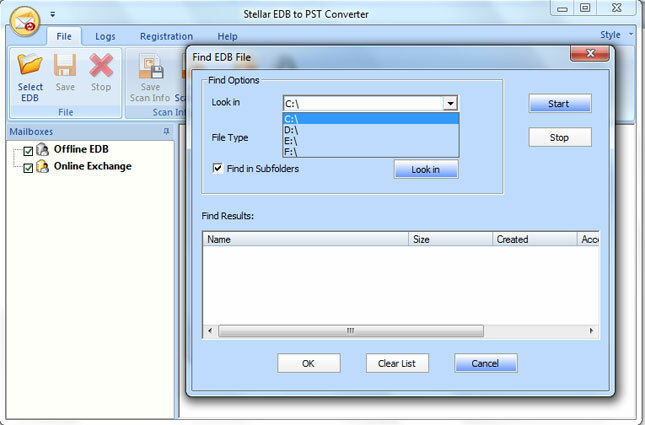 Step 3: After you have selected the EDB file for conversion, click on the Start tab for the tool to start the scanning process of the selected Exchange database file. Once the scanning process gets over, all the converted mailbox components get displayed in the left pane of the tool’s window. Step 4: Next, preview all the mailbox items that are present in the same interface of the tool. You can do this by selecting a particular data item at a time. Step 5: Now, select all the data items in the mailbox that you want to save on your machine. Step 6: Finally, click on the Save tab on the toolbar of the conversion software. With this, you will be able to save all user mailboxes in the EDB file as PST files at any preferred location on your machine. 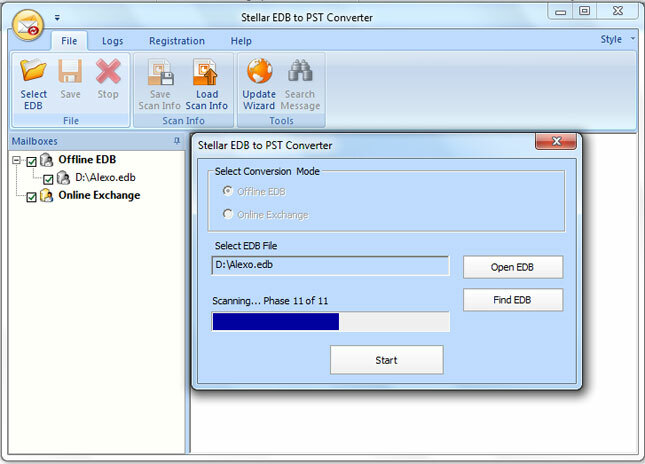 Now that you know the steps that you should perform to run Stellar EDB to PST Converter, you can easily use it to convert the database file of Exchange Server into Outlook data file. Further, you can import these data files in the Microsoft Outlook email client and access its data items. All that you require doing is, run the software in a proper way. Embedded with several advantageous features and simple working it serves as one of the best EDB to PST conversion tool for both novice users and people with technical know-how. Your support team made our journey simple & error-free. We are always ready to fix the problems of our valued customers.